StarTrek.com have launched a micro-site to highlight the artwork to be featured in the forthcoming 50 Artists 50 Years art exhibition. 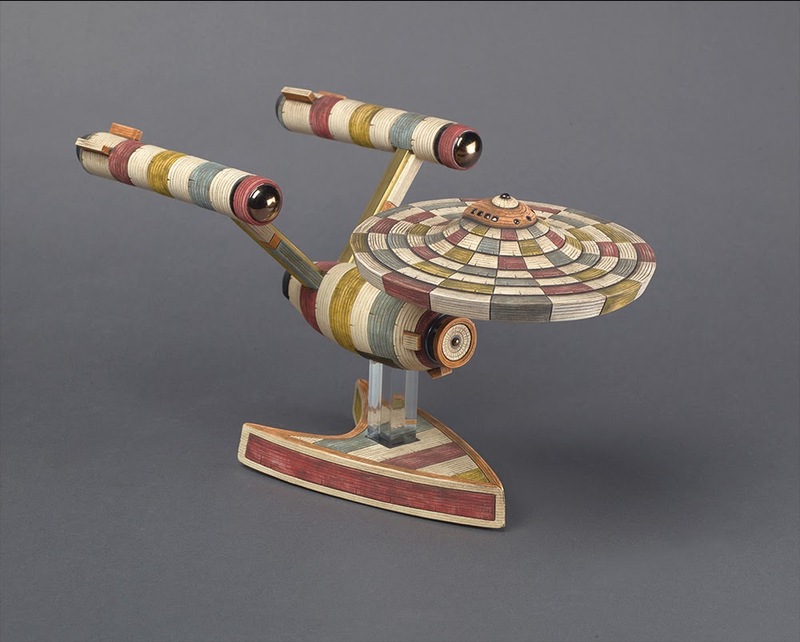 Commissioned to mark Star Trek's 50th anniversary, the touring exhibition will feature a wide variety of artwork, including illustrations, photographs, sculptures, paintings, and graphics. Not all of the artwork has been revealed yet, but StarTrek.com have started to release it a few entries at a time, with creator interviews discussing each work. Those creators are equally as diverse as the mediums, including many familiar names from the world of Star Trek comics, Juan Ortiz (who previously brought us the retro print series), entries associated with the US Postal Service (the new TOS stamp artwork), and Mattel (I presume these will be Mega Bloks sculptures, but they've not been revealed yet), and perhaps most notably of all, the final piece of photographic art from the late Leonard Nimoy. 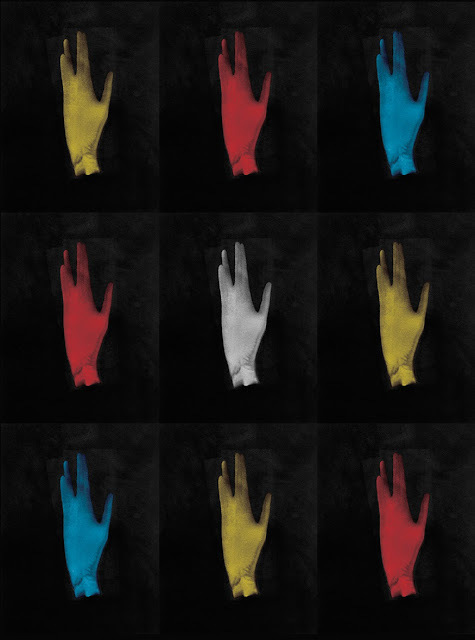 Nimoy had this amazing photo of his own hand. We worked with him to create this multicolored version. We were working with him and had completely gotten it done. Then he got sick very, very quickly. He passed away. Two weeks later, we picked up with Susan [Nimoy's widow] to finish it. My piece for this show is the Enterprise decorated with aged wood-like textures and patterns, much like the style I use in my other artwork. Before starting the piece, I gathered as much reference material as I could to get an idea of the proportions of the Enterprise. I roughly sketched out on a piece of paper the actual scale I would be working with as a guide and worked off that. The fun part was jumping into the clay and hand-building all the different parts. I work mainly with ceramic, so all my pieces are fired in a kiln, glazed and fired again. 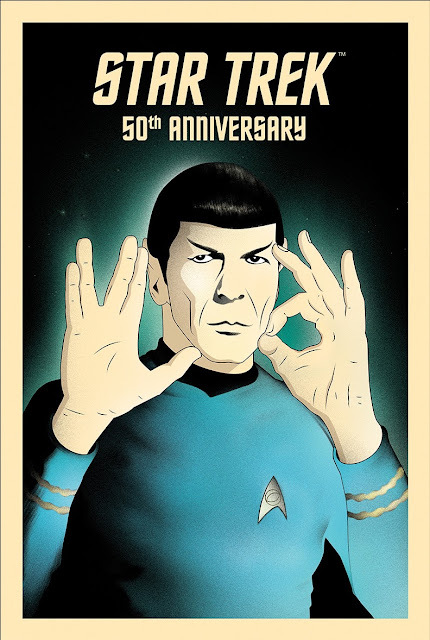 Then Spock is the focus again in Rocco Malatesta's illustration 50 - Live Long and Prosper. The final piece revealed to date is the now familiar artwork for this year's set of Star Trek postage stamps from the US Postal Service. It appears the artwork will be displayed with a set of the actual stamps. The illustrations are by Jason Kernevich and Dustin Summers, who work together as "Heads of State". 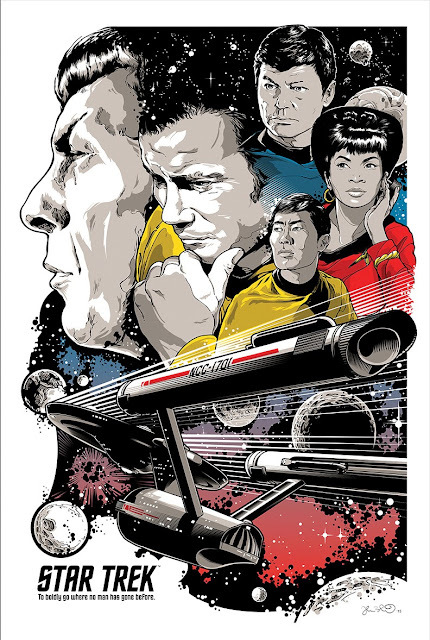 A few other bits of artwork have been spotted, but StarTrek.com haven't posted the full details yet. 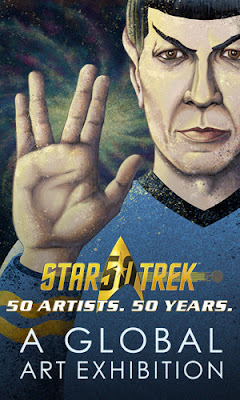 Those include the artwork from the promotional banner at the top of the page, and a couple more images seen in preview pages from the 50 Artists 50 Years calendar, which includes another Spock portrait and (to the relief of fans of the wider Trekverse) a TNG illustration. 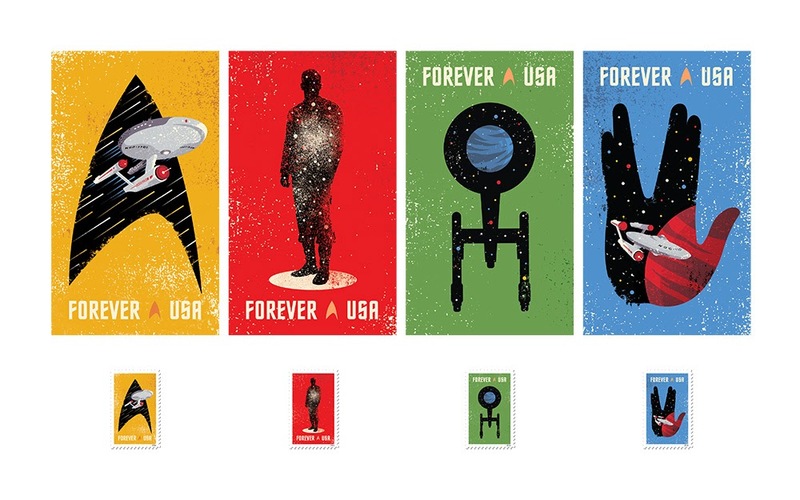 Like the retro prints series before, CBS will be making wide use of the artwork from the exhibition. In addition to the calendar we can expect posters and other prints, stationary, trading cards, accessories and apparel, glassware, and perhaps most importantly for anyone that can't make it to the exhibition itself, a book from Titan Books collecting all the artwork. 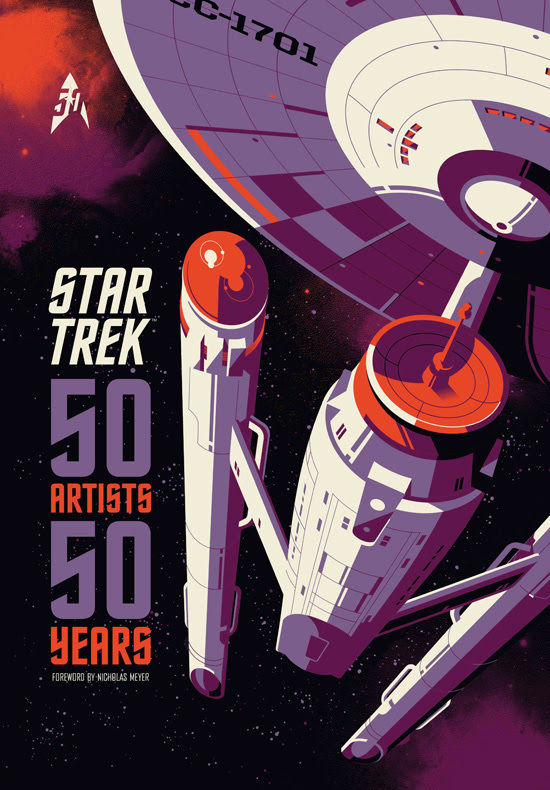 The 50 Artists 50 Years book is expected to arrive in September, and appears to use a variation of Tom Whalen's artwork. The cover also promises an introduction from Nicholas Meyer. If you want to see the artwork in the flesh, the exhibition promises to be an international tour, kicking off at the San Diego Comic Con in July where it will be hosted by Michael J. Wolf Fine Arts. In August it will be at the Star Trek Las Vegas convention, before moving to Canada for a couple of weeks at the Canadian National Exhibition in Toronto. It will then head over the ocean to Birmingham in England for the Destination Star Trek convention in October. Other venues have yet to be revealed. Make sure to visit StarTrek.com's 50 Artists 50 Years site to check out new artwork and interviews from the exhibition as they are revealed.